If we avoid meat because we don’t want to cause violence, then doesn’t eating vegetables also involve violence? 1. As our very survival necessitates food which requires some amount of violence, we can’t avoid it entirely, so we should try to minimize it. 2. The pain depends on the development of nervous system. 3. To get an intuitive understanding of which is congenial compare the atmosphere in a farm during harvesting with the atmosphere in a slaughterhouse while animals are being killed. If we are vegetarian because we don’t want to kill animals – they are the children of God – then why do we kill plants to eat? 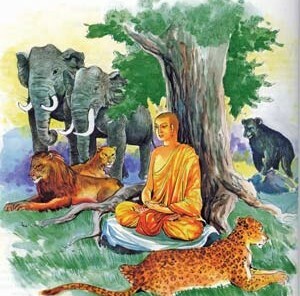 It is true that all of creation and all created beings whether humans, animals or plants, are the children of God and therefore the ideal situation would be to cause no violence. But since it is not a practical option for us w settle for the option where there is minimum violence. Of course you pointed out how when we pluck fruits which are ripened and which would anyway fall off, there is very little if not no pain involved. So those who are very austere sages who live in the forest they live practically not even on plucked fruits but only fallen fruits and fallen leaves so that don’t cause any violence at all. So the Vedic scriptures do talk about that as the highest standard for avoiding causing of all suffering to all living beings and for minimizing the karmic reactions that we may get. But for most people that standard is not practically possible. Now when we compare relatively speaking between plants and animals, first of all even from a scientific point of view the animals have a far more developed nervous system than do the plants. And depending on the development of the nervous system the organism/living being feels that much more or less pain. So that’s why we want to minimize the pain that we cause to other living beings so we avoid eating animals because they feel far, far more pain than the plants. Now certainly plants also do feel pain but for example when we harvest the crops that are fully grown – if they are not harvested they will rot and they will get wasted. If we compare the enlivening atmosphere at the time of harvest in the field with the gruesome atmosphere in the slaughter house when the animals are to be slaughtered with blood and flesh strewn and spewing all around and the animals screaming and writhing in pain, our own conscience and intelligence will indicate to us the huge gulf of difference. Most animals are not killed when they are about to grow old and die. Infact Srila Prabhupada – the founder Acharya of ISKCON – recommended that if people had to at all eat meat they could wait till the animals die and then they eat so that atleast the karma of killing the animals would be minimized. So now when we harvest the crop when they are at the right time for harvesting that is the time when nature indicates through the soothing atmosphere prevalent at the time of harvesting that it is the right thing to do. So ofcourse even when we harvest the crop there is pain that is why vegetarianism itself is not enough. We have to go beyond vegetarianism to offer food to God with the attitude of humble devotion then Lord Krishna promises in the Bhagavad Gita that he will take away all the sins. is talking about the glory of the principle of devotion wherein if somebody offers the Lord with devotion then even the simplest of foods are ready to be accepted by the Lord with joy. So the emphasis in this verse is on the principle of devotion. The verse is not a comprehensive listing of all the foods that can be eaten or cannot be eaten. Still it is clear from this verse, there is no meat or animal food mentioned over here. So patram, pushpam, phalam, toyam refers to a vegetarian diet which can be sanctified by being offered to God then it becomes karma-free and pure. Is vegetarianism necessary for spiritual advancement? drinking milk is without violence! Meat-eating is notoriously inefficient. No one can deny that the resources required for a meat-centered diet far outweigh the resources needed for a vegetarian diet. It takes over 17 pounds of grain to produce a single pound of beef. So even if a person wants to avoid killing plants, he would become a vegetarian, because far less plants are required to support his diet (rather than the large amount of plants that the cow would have consumed to supply his beef).